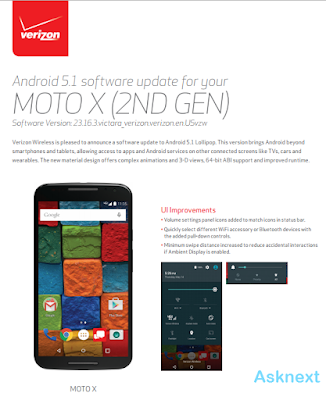 Android 5.1 Lollipop has been released for Verizon Motorola Moto X 2014 though OTA. Android 5.1 Lollipop brings UI improvemnet like Volume settings panel icons added to match icons in status bar, quickly select deifferent Wi-Fi accessory or Bluetooth devices with added pull-down controls and minumum swipe distance increased to reduce accidental interactions if Ambient Display is enabled. The spftware update version is 23.16.3. Some other tweaks including Factory reset protection to help reduce theft and if device lost or stolen is remian unlocked until the Google account on phone is signed.